Expand search to view more listings in and around Oak Park. See more offices in and around Oak Park. We have a wide range of office spaces for rent in Oak Park IL, including private offices, coworking space, serviced workspace, shared office space for rent as well as virtual offices. Many of the business centers and Oak Park commercial real estate properties for lease that we feature offer easy, short term, flexible rental contracts, meaning that your business can gain the benefits of an extensive range of facilities and a prestigious address in Oak Park, without being locked in to a multi-year lease in Oak Park, Illinois. No matter what size your company is or what business requirements you have, we have private and shared offices for rent, virtual solutions and commercial spaces for lease to suit your needs. Many of the business centers come inclusive of a wide range of amenities and services, with friendly reception staff, security and onsite IT personnel, extra desk space, WiFi and high speed internet services. Many of the private and shared office properties for lease also provide video conferencing facilities, spacious conference rooms, and kitchens. With flexible contracts and a range of professional business support services and amenities included, the above listed private and shared office space for rent is a great fit for any company. Select your preferred center and fill out the quick quote form or call us now on 1-877-693-6433 and let us assist you in searching for the perfect Oak Park office space for rent. The Madison Street Corridor offers more modern space (usually built in the 2000s), and attracts tenants in the Oak Park medical industry and public sector agencies, whereas the Arts District (and particularly the area between Columbus Park and the Chicago IL - Kansas Expressway) is a hub for firms involved in the creative sector. Several areas are being redeveloped with a focus on mixed-used developments. The most relevant developments for businesses and business owners in search of office space for lease in Oak Park include The Bend, located on Madison Street, which will add some 13,000 square feet of Class A space, and some smaller developments in the area between Wesley Avenue and South Oak Park, Illinois. Average Costs: Price-wise, office space in Oak Park is much more affordable than what is available in the Chicago IL core. Average asking prices range between $18 and $22 / sq ft / year, although some of the most modern units can reach $30 / sq ft / year in areas like North Harlem Avenue, North Oak Park, and North Marion St. The lowest priced offices tend to be in South Oak Park and areas south of Madison Street, whereas the best sub-markets for mid-range options are the Arts District and Harrison Street (2017 data). Click on any of the well situated Oak Park commercial real estate listed above. 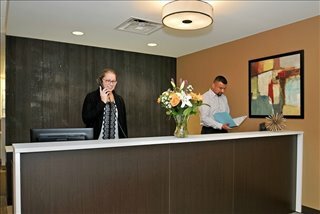 The Oak Park retail space, private offices, furnished office space, coworking space, commercial space, virtual offices and shared office space for rent that we feature on this site are all located in prime business areas, and are available to lease in Oak Park on competitive, flexible rental terms to suit your company's needs. The village of Oak Park is situated approximately 10 miles west of downtown Chicago, IL, half way between O'Hare International and Chicago Midway. This is a densely populated urban center and one of the largest municipalities in the state of Illinois. Although Oak Park was initially developed as a suburban residential area for people who worked in Chicago, today the village has its own business community that makes the most of the village's location and proximity to the city. According to the local chamber of commerce, there are approximately 2,000 businesses based in Oak Park, Illinois. The village also has a renowned arts scene that draws tourists and daytime visitors, as well as a strong industry base where the predominant sectors are Oak Park retail, food and beverages, recreation, healthcare services, and wellness. The largest employer is Rush Oak Park Hospital (with nearly 1,000 employees), followed by the Village of Oak Park, Oak Park District Office, Fenwick High School, and retailers like Target and Jewel Osco. and the support offered by the local council to new businesses in designated areas and Tax Increment Finance Districts. Some Oak Park companies may be eligible to receive performance-based incentives of both a financial and a non-monetary nature, alongside other forms of support irrespective of size or industry sector. More information is available from the Business Services Division at Oak Park Council, the Oak Park - River Forest Chamber of Commerce, and the Oak Park Economic Development Corporation. We have more spaces for lease than ever before with prices to suit every budget. Call us and we will do everything we can to help you find the perfect coworking space, furnished office space, private office suite, industrial space, shared office space or virtual office space in Oak Park IL.